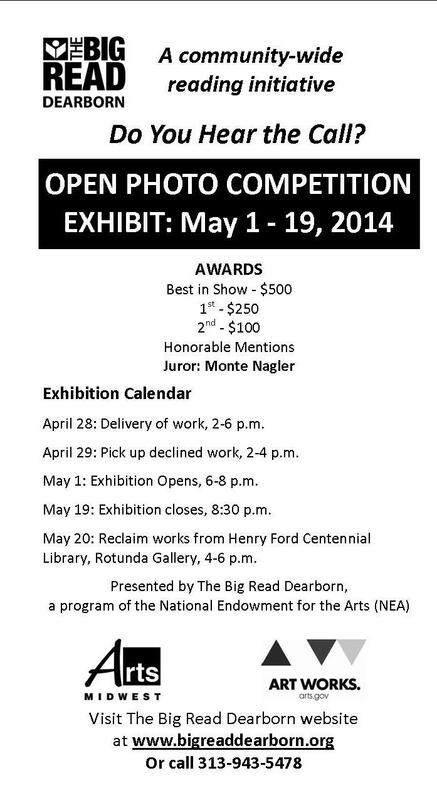 Announcing The Big Read Dearborn Open Photo Competition! We’re calling for entries in an open photo competition to recognize outstanding photographic images featuring themes of nature, wildlife and the environment. A non-juried Youth Photo Exhibition is open to children and teens through age 18. There is no fee for this exhibition. For specific details about preparing and delivering entries for submission in the competition, download the entry form, pick up an entry form at any Dearborn Public Library location or the Ford Community & Performing Arts Center, or call 313-943-5478. Many additional events will take place March 8 through May 17 as part of The Big Read Dearborn beginning with a free kickoff event, 11 a.m.-2 p.m. on March 8 at The Henry Ford.